A couple of hours later, he looked like a guy capable of playing well beyond the final night of his career. But that was secondary to a last chance to celebrate Wade, the three-time NBA champion who was ending his 16th and final NBA season. Heat: Haslem finished with 12 points and 11 rebounds. … Wade passed Elgin Baylor (23,149 points) to move into 29th place on the NBA’s career list. He finished with 23,165. Nets: Starters Joe Harris (toe) and DeMarre Carroll (right wrist) sat out, though Atkinson said they would be ready for the playoff opener. … Shabazz Napier scored 20 points off the bench. Wade has been exchanging jerseys with players after games this season, but there was one missing. 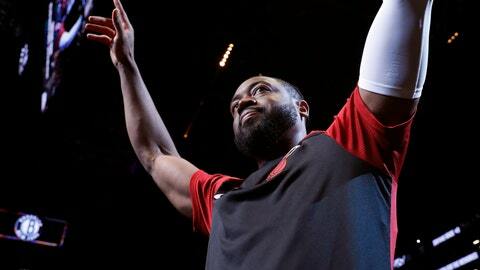 Anthony, who helped persuade Wade to return this season, didn’t play long this season before parting ways with Houston. So Wade gave his final one to him.